Learn how to use your cellphone to find items to resell at big profits. Find out which apps are the best, and how to use them. Check prices instantly, and know your potential profits before risking a dime. Learn to resell on eBay and Amazon, and rake in the profits. 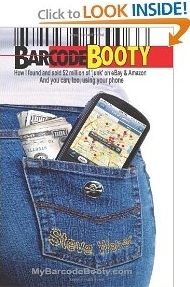 Learn how to use your cellphone as a treasure detector, and find items to resell at big profits. Find out which apps are the best, and how to use them. Check prices instantly, and know your potential profits before risking a dime. Learn to resell on eBay and Amazon, and rake in the profits. Find bargain inventory virtually anywhere - yard sales, retail stores, outlet malls, warehouse clubs, wholesale dealers, bargain basements, and online bulk suppliers. Learn to specialize in books, videos, games, toys, electronics, grocery, fashion, health and beauty, auto parts, niche regional products - or take them all! Many books promise to teach you how to start an online business. Look closely, though, and you'll see that very few are written by someone who's really done it. Author Steve Weber has been a full-time, five-star seller on Amazon.com and eBay for ten years! Uncover online shoppers want to buy. The Internet Gold Rush is just getting started. In this insider's guide to online selling, you'll learn the secrets to profitable trading. You can profit from price differences in local and global markets. This book teaches you how, every step of the way. One weekend last February, my wife and I packed a big suitcase, put our two children in the car, and drove up Interstate 95 to visit my mother-in-law near Philadelphia. Saturday morning was bitter cold, but to get some fresh air, I took my 5-year-old son for a drive. Right down the road, before the car had warmed up, I spotted it - a big TJ Maxx store. I hadn't shopped there for 20 years, but recently I'd heard TJ and similar discounters were becoming gold mines for Internet sellers like me. For 10 years, I'd been an online bookseller, and kept so busy with it I'd never thought about selling anything else. But it never hurts to try something new. We made a quick U-turn, pulled into the TJ parking lot, and backed our minivan up to the front door. Grabbing a shopping cart, we strolled through the door, right past the purses, beyond the bathrobes, and around the skirts. I craned my neck, squinted through my bifo-cals, and grinned - almost there. "Toys!" my boy squealed. Or did I say it first? Anyway, it was true - the back shelves were jam-packed with toys of every kind. Hundreds of them! Dart guns, dolls, train sets, miniature china, soccer balls, board games - all marked way below retail. Was it my imagination, or could I see more variety right here than in a mammoth, big-box toy store? "Looks like Santa had some leftovers this year," I told my son. "Let's look around." I didn't know where to begin. On the bottom shelf, partly hidden toward the back, was the biggest, most intriguing box in the store. Inside was a giant, remote controlled robot. I'd never seen anything like it, and I wasn't prepared for the price - $30, batteries not included. Gulp. I almost threw it back. "Let's get it, Daddy!" my son shouted. I glanced around at a few raised eyebrows from the older ladies rummaging through the dress racks. I felt my ears getting red. I caught my breath. The ladies went back to their shopping, and I pulled the phone from my pocket. "Who are you calling, Daddy?" my son asked. "Just checking something," I said. After pointing my phone at the bar-code on the robot box, my phone emitted a soft "beep" and then displayed its Amazon price, $280. "Holy cow!" I muttered, "I've made about $250, and we just got here." I dropped the robot into the cart, with the same satisfaction I might get from hitting a hole-in-one, or pulling a slot-machine arm and hearing the jackpot rain down, red lights flashing. But this was no gamble. Thanks to my phone's free scouting app, I knew my likely profit before risking a dime. The feeling was familiar, but the surroundings were refreshing. In the past decade as a secondhand bookseller, I'd worn out the knees on five pairs of jeans by scooting around in musty basements and moldy attics hunting for books. Here, in a brightly lit room with the smell of perfume, soft music, and friendly people, it hardly felt like work at all. Diversification is good. For a decade, I'd made my living selling books, mainly on Amazon. I'd developed a knack for spotting valuable books just by looking at the cover. Now, with a price scouting app on my phone, I could improve my book-picking tremendously, and expand into toys while I was at it. And why stop at toys? Now that Amazon has opened virtually all its categories to us independent sellers, I could sell virtually anything. Instead of waiting until the weekend for yard sales or library fundraisers, I could scout for inventory anytime, practically anywhere - Wal-Mart, the pharmacy, the local warehouse club. That's what this book is about: cashing in on stuff other people have written off as "junk." The bean counters at a big retail chain - perhaps Target or Toys 'R Us - decided those robots didn't sell fast enough, or they didn't have enough left for a big display. So, to free up cash and shelf space, they dumped the rest at TJ Maxx for pennies on the dollar. Using my phone's scouting app, I found 11 more money-making toys that day at TJ Maxx - vintage Cabbage Patch dolls, last year's Thomas the Train accessories, special-edition Monopoly games. All were in short supply online, commanding $75 to $120, while gathering dust at the back of TJ's, marked down to $20 or $30. After an hour of treasure hunting, I left the store with my son, who helped me load the van. He'd forgotten about the robot after finding a football jersey (an Eagles McNabb No. 5) and a giant puzzle (marked down 75 percent). Not including those goodies, I'd spent $130 to get $1,000 worth of inventory. After dinner that evening, I smiled and told a briefer version of my robot story. Some people are amazed to learn how you can earn money using your phone, without even making a call. "Incredible!" "Just another day at the office," I said, rolling my toothpick. Then I turned to my wife and said, "Honey, we need to visit your mom more often!" And that, perhaps, was the biggest surprise of the whole weekend.